Delight in beachfront Shipwatch Surf and Yacht Club, for relaxation, for boating, for pure enjoyment. This unique property is located on 500 FT of beach front and also offers old river access across the street. These spacious condos boost a Southern Living, cottage atmosphere. 1364 SF and beautifully furnished with ceramic tile throughout. Electronics include 32" TV, DVD in Living Room, 20" TV's in Master and Guest Bedroom, 27" TV in second Guest Bedroom. Our booking was completed with very short notice after our original destination was destroyed by the devastating hurricane. Everyone was very friendly and helpful. In addition, I had some business to take care of during our stay and your office printed and faxed the information so my time sensitive business could be completed. This was going above and beyond. I am very thankful. It was peaceful and refreshing. The unit was excellent. Views are awesome! Location is quiet, which was grand! 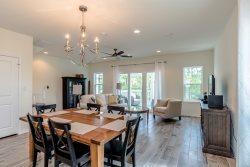 Close to everything including less than a mile to Orange Beach, AL. Many items I brought were already available- Crock pot, steak knifes.. ect. We will return to the area using Perdido Realty for our options. We enjoyed our stay. The ladies in the office across the street are so nice. We also really appreciated our chair guy. Property was in a great location and the complex was quiet. The kitchen could have used a few more amenities, but we made due with what was there. Had a great vacation! Your office team was excellent...efficient, knowledgible and helpful. Thanks for making our visit so perfect.